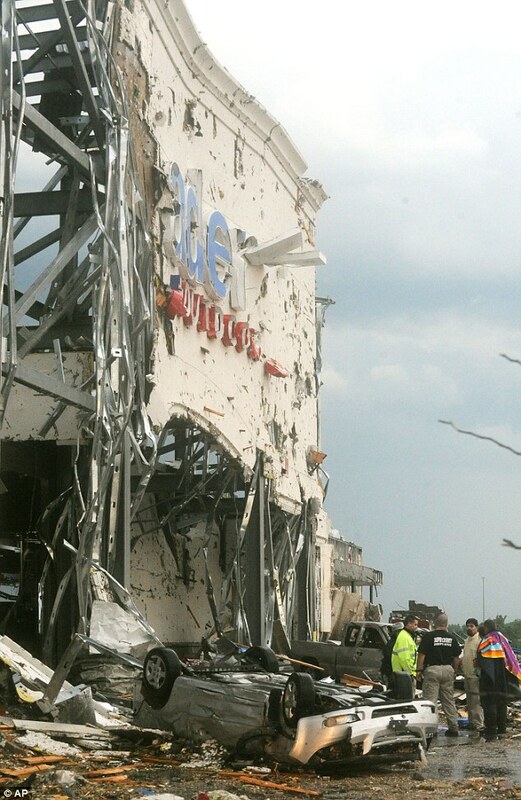 Officials in Joplin, Missouri said Monday morning that 89 people died as a result of the tornado that "tore a destructive path" through the city. Both state and local emergencies have been declared. The tornado's path was at least 1 mile wide in some areas and possibly larger in other areas. "We know many people are hurting at this time and it is indeed a sad day in Joplin," City Manager Mark Rohr said during a press conference. 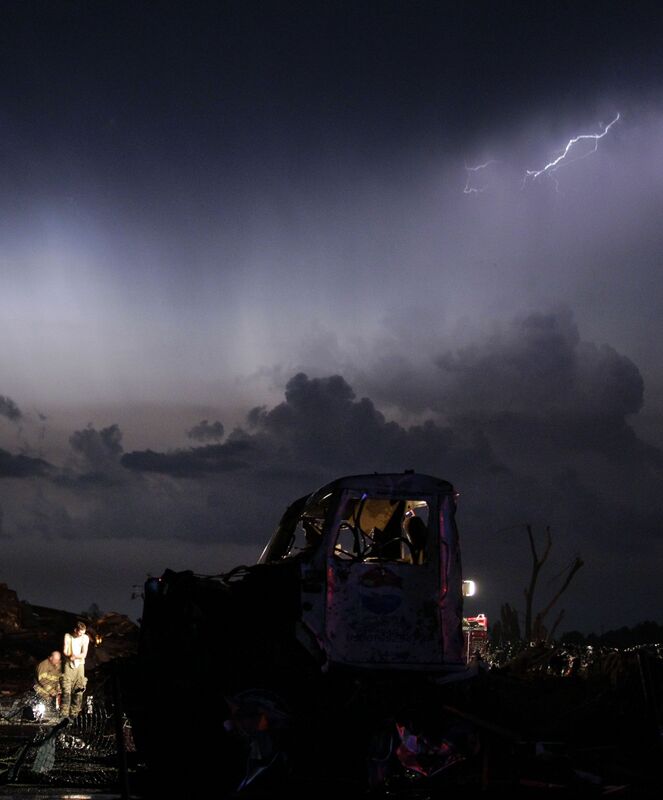 [Updated at 6:27 a.m.] A Red Cross worker estimates 75 percent of Joplin, Missouri was destroyed by last night's vicious tornado that hurled debris as far as 70 miles away. The high school, the hospital, a couple of fire stations and a strip mall - all in shambles. Governor Jay Nixon has called in the National Guard. Officials are expected to hold a press conference at 6:30 a.m. to update the press on the situation on the ground. Aerials and videos show massive destruction across town. Correction: One of the pics posted above may be from the tornado that hit Reading, KS over the weekend. JOPLIN, Mo. 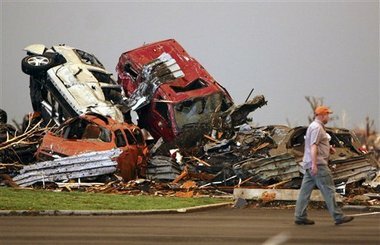 (AP) — A massive tornado that tore a 6-mile path across southwestern Missouri killed at least 89 people as it slammed into the city of Joplin, ripping into a hospital, crushing cars like soda cans and leaving a forest of splintered tree trunks behind where entire neighborhoods once stood. Authorities warned that the death toll could climb as search and rescuers continued their work. Their task was made more miserable Monday morning as a thunderstorm with strong, gusty winds and heavy rain pelted part of the city with quarter-size hail. City manager Mark Rohr announced the number of known dead at a pre-dawn news conference outside the wreckage of a hospital that took a direct hit from Sunday's storm. Rohr said the twister cut a path nearly 6 miles long and more than a half-mile wide through the center of town, adding that tornado sirens gave residents about a 20-minute warning before the tornado touched down on the city's west side. Much of the city's south side was leveled, with churches, schools, businesses and homes reduced to ruins. Fire chief Mitch Randles estimated 25 percent to 30 percent of the city was damaged, and said his own home was among the buildings destroyed as the twister swept through this city of about 50,000 people some 160 miles south of Kansas City. Authorities conducted a door-to-door search of the damaged area Monday morning, moving gingerly around downed power lines, jagged debris and a series of gas leaks that caused fires around the city overnight. 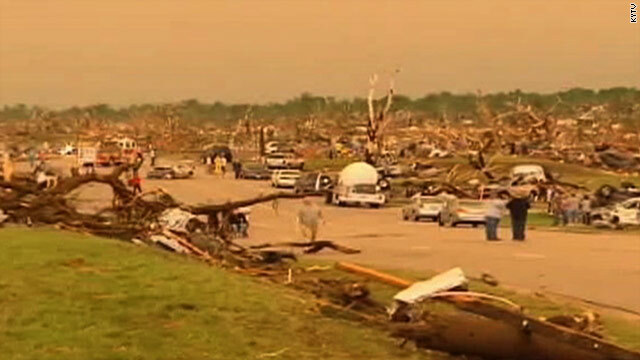 The Joplin twister was one of 68 reported tornadoes across seven Midwest states over the weekend, stretching from Oklahoma to Wisconsin, according to the National Weather Service's Storm Prediction Center. One person was killed in Minneapolis. 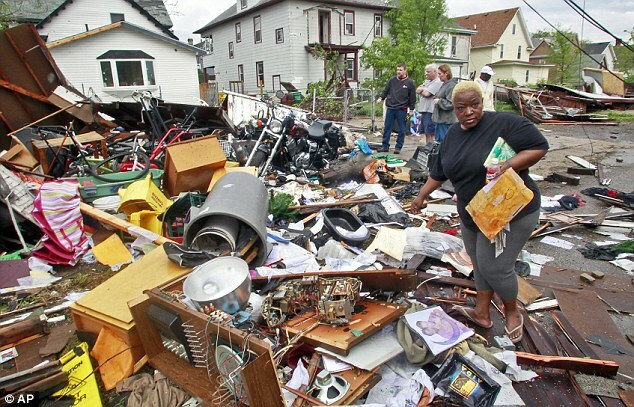 But the devastation in Missouri was the worst, eerily reminiscent of the tornadoes that killed more than 300 people across the South last month. In the parking lot, a helicopter lay crushed on its side, its rotors torn apart and windows smashed. 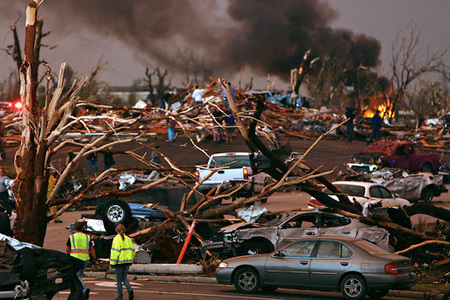 Nearby, a pile of cars lay crumpled into a single mass of twisted metal. Matt Sheffer dodged downed power lines, trees and closed streets to make it to his dental office across from the hospital. Rubble littered a flattened lot where a pharmacy, gas station and some doctors' offices once stood. Miranda Lewis, a spokeswoman for St. John's, was at home when the tornado sirens began going off. Early Monday, she had no details on any deaths or injuries suffered at the hospital in the tornado strike, although she had seen the damaged building. Triage centers and shelters set up around the city quickly filled to capacity. At Memorial Hall, a downtown entertainment venue, nurses and other emergency workers from across the region were treating critically injured patients. Emergency management officials rushed heavy equipment to Joplin to help lift debris and clear the way for search and recovery operations. Nixon declared a state of emergency, and President Barack Obama said the Federal Emergency Management Agency was working with state and local agencies. 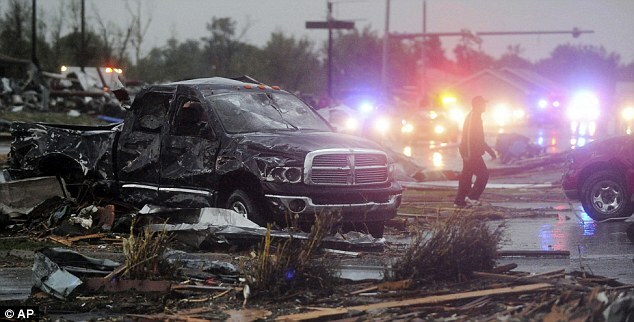 A tornado that hit north Minneapolis killed one person and injured 29. Authorities imposed an overnight curfew over a 4-square-mile area, including some of the city's poorest neighborhoods, to prevent looting and keep streets clear for emergency crews. 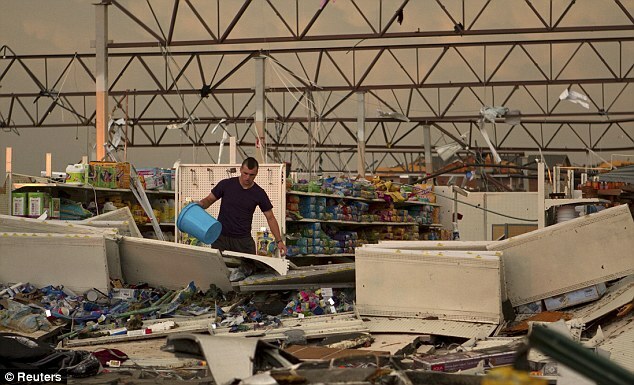 Mayor R.T. Rybak said one liquor store was looted right after the tornado hit late Sunday and a few burglaries took place overnight. An advisory from the Storm Prediction Center in Norman, Okla., said warm weather Monday could fuel instability in advance of another weather system. A few tornadoes, some strong, could occur — starting in Oklahoma and southern Kansas in the afternoon and in North Texas in the late afternoon. 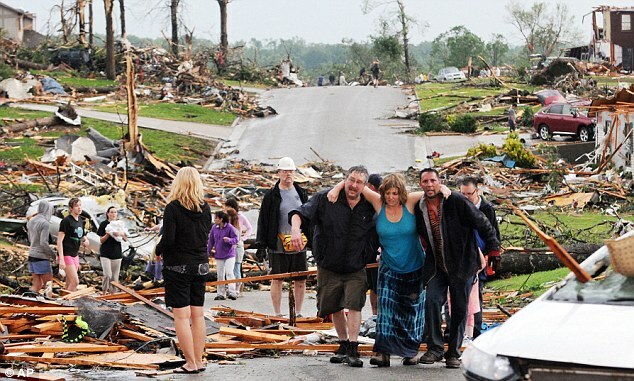 Associated Press writers Jim Salter in Joplin; Heather Hollingsworth, Dana Fields, Chris Clark and Bill Draper in Kansas City, Mo. ; Todd Richmond in La Crosse, Wis.; Chris Williams and Jeff Baenen in Minneapolis; and Kristi Eaton in Oklahoma City, contributed to this report.